The investigation by Robert S. Mueller III, the special counsel, has uncovered several incidents involving President Trump that raise questions about whether he obstructed justice. Mr. Trump is said to have instructed the White House’s top lawyer to stop Attorney General Jeff Sessions from recusing himself, with the expectation that Mr. Sessions would shield him. Career prosecutors shut down the case in 2016 over lack of evidence. The new interest comes as President Trump has taken the highly unusual step of calling for investigations of political rivals. The first known criminal referral has emerged from Congress’s Russia inquiries. The target is the author of the Trump-Russia dossier. Stephen K. Bannon is confronting political irrelevance, a dire fate for a publicity-hungry provocateur, as some of his most important backers recoil after his reported criticisms of President Trump and his family. Lawmakers from both parties see it as a state decision and vow to force the attorney general, Jeff Sessions, to back down. The report, which offers a picture of how the economy fared in President Trump’s first year in office, marks the 87th consecutive month of job growth. Airports shut, schools closed and cars slid during the first major storm in the U.S. this winter. Officials fear the worst is ahead as wind chills are expected to hit minus 40 in some areas. Here’s what New York City looked liked on Instagram as a powerful storm brought bitter cold and strong winds to the region. A closer look at the largest protests in Iran in years suggests that the country’s president may have started it all. Plus, marijuana distributors react to the White House’s threat of a crackdown. If you loathe winter, you’re not alone. But there are ways to get through. Cities around the world that are currently trending in the right direction for budget fare hunters, and why you might want to visit them in 2018. 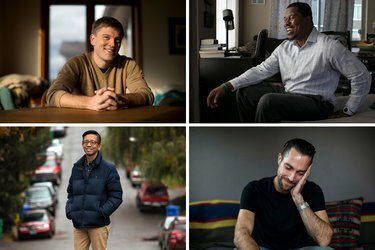 Male nurses explain how the field is changing, and how it could help address a problem for men: The fastest-growing jobs are mostly done by women. The Dow at 25,000: The Party Has to End, but When? “I feel like I’ve done the job as well or better than anybody who’s ever had it,” said Gov. Chris Christie, a friend of President Trump for 15 years. There is something unsettling about how little these celebrities have to lose by taking “bold” stances, a Times Magazine reporter writes. Chinese consumers are demanding better protections even as government and tech giants like Alibaba and Tencent gather ever more data. Clairmont Nichols Opticians in Midtown East has been filling prescriptions and repairing glasses since 1885. Critics, however, accuse the government of willfully stoking anxieties about migration, assimilation and sentencing for political purposes. This inventive restaurant in Sydney is an exemplar of Australia’s seafood prowess. Who Are the N.F.L.’s Fastest Players? Thanks to computer chips inserted into N.F.L. players’ shoulder pads, we can measure the speed at which the game is played. Southwest will let 12-year-olds fly solo. Other airlines want them in their unaccompanied minor programs for an extra $150 each way. But why? A writing Brooklyn workshop, conducted in both Spanish and English, helps caregivers explore their role in children’s lives by writing fables. New reporting makes for a compelling case that he did, on multiple counts. The United Arab Emirates has a brazen plan to deal with its stateless population. It could set a dangerous precedent. Brooks: How Would Jesus Drive? Tthe president has still not appointed a science adviser. Alternative-health gurus harness the language of medicine to sound authoritative. Doctors must push back. Can Central Florida Claim a National Title? Reform might not have been possible there without the activists and intellectuals who struggled and suffered. Common Sense: After Dow 25,000, the Party Has to End. But When? Op-Ed Contributor: Publicly, We Say #MeToo. Privately, We Have Misgivings.